Deck the Roof: Tips for Safe Roof Decorating - JA Edwards of America, Inc.
After you’ve decked the halls with boughs of holly, it’s time to string up the lights for some roof decorating. 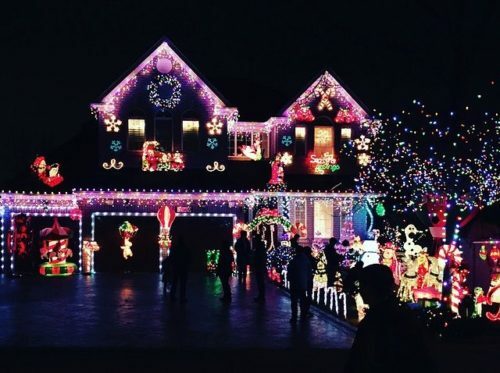 Part of the magic of the holiday season in the Orlando area is the bright and colorful twinkle of a house trimmed with lights. Follow these tips to create a magical, safe, and secure holiday light display. First, insure that all of your roof decorating equipment is rated for outdoor use. Both the lights and any extension cords should be suitable to withstand the elements. Using indoor lights on your roof can create potentially dangerous and damaging situations. The last thing you want is to spend hours installing your roof decorations only to find that they won’t light up. Make sure all of your displays work properly. Do all the light bulbs work? Do the programming boxes function correctly? If any of your components move, do all the parts move like they are supposed to move? Are all of the fuses intact? Are your outdoor outlets protected and functional? A few minutes of diligence at this point will save you hours of frustration later. Before you put a foot on a ladder, know exactly what you’re going to put where. Take the time to measure distances so that you know how far your light strings will stretch. Which strings will extend from which junction? Where will the cords go? How will you secure everything? Most injuries associated with roof decorating occur when ladders tip or when people slip. Each time you place the ladder, double check the footing. Work with a buddy who can secure the ladder as you climb and install the decorations. You might be tempted to extend your roof decorating higher up on your home, which would mean a trip up onto the roof. As we here at J. A. Edwards America advised in this blog, you should avoid going onto your roof. Any walking on the roof can damage the shingles. Stick with what you can reach from a ladder. As long as you’re on the ladder, you should do a quick visual inspection of your roof. Follow the advice here for that inspection. Why not kill two birds with one stone? While using staples to secure your roof decorating will certainly make the lights more secure, you will also be damaging your home. Even tiny holes from the staples can compromise the integrity of the shingles and the trim and can allow an entry point for water. Over time, even a small amount of water in a small hole can ruin wood. Instead, install a reusable clip system that will keep your decorations in place without damaging your roof. From all of here at J. A. Edwards America, have a safe and happy holiday season!